It was February 19, 1965, a few months after the Tokyo Olympic Games. A collection of international track stars, many fresh from medaling in Tokyo, gathered at Madison Square Garden in New York City for the AAU National Indoor Track Championships. Billy Mills, the first and only American to win the gold in the 10,000 meters in the Olympics, won the three-mile race. In a rematch of the Tokyo Olympics men’s long jump, USSR’s Igor Ter-Ovesyan outdistanced America’s Ralph Boston. Tamara Press repeated as champion in the shot put. Iolanda Balas of Romania continued her dominance in the high jump. And Mary Rand was also in town. But the women’s long jump champion of the 1964 Tokyo Olympics faded quickly in Madison Square Garden, crashing out in the preliminary rounds by fouling two of her three jumps. The runway for the long jump did have a quirky quality: there were two take-off boards on the runway, the white indicators that tell the athlete exactly how far they can step before they launch themselves into the air. But she didn’t feel that was the reason for her poor performance, as she wrote in her autobiography, “Mary Mary“. We were having problems because on the long jump approach there were two take-off boards very close to each other. You had to pass over the first one just before taking off, which was a bit distracting. I wasn’t jumping particularly well. In fact I was fed-up with my jumping more than irritated by the other board. Mary Rand jumping from the second take-off board. Click on the image to watch the actual video. So Rand was in her hotel room when she heard a knocking on her door. It was American long jumper, Whillye White, silver medalist in the long jump at the 1956 Melbourne Games, and silver medalist in the 4X100 relay at the 1964 Tokyo Olympics. White came to explain to Rand that she had protested the outcome of the preliminary round because the first take-off stripe should not have been on the track in the first place. White said to Rand that she had told officials that the first stripe upset her, and it must have upset the other competitors as well, and that she said Rand could join the other six in the finals. I might have said something about it being “stupid” – but I would never have dreamed of protesting. I said I wouldn’t come back unless it was absolutely all right with all the other jumpers, because it did mean that I might go ahead and win. But Willye had already put it to all the other athletes, I was told, and they had all agreed. So Rand returned, and she landed a jump of 20 feet 4 inches, over a foot shorter than her Olympic record in Tokyo, but good enough for first place in New York. Thanks to Whillye White! There was a time when the Japanese were seen as great jumpers. In the years between the great world wars of the 20th century, Japanese men in particular were frequent medalists in the triple jump, long jump and pole vault. Shuhei Nishida won silver in the pole vault at the 1932 and 1936 Olympics. Sueo Oe won bronze in the pole vault in 1936 as well. Naoto Tajima won the gold medal in the triple jump in 1936, making it the third consecutive Olympics that a Japanese won the hop, skip and jump – Mikio Oda won it in 1928 in Amsterdam, while Chuhei Nambu took gold at the 1932 LA Games. Tajima may have won gold in the triple jump, but he enjoyed his bronze medal in the long jump even more. He is said to have considered the triple jump just a simple matter of technique while the long jump was more of a profession, something requiring a more serious, in-depth approach. Perhaps also significantly, Tajima’s long jump competition at the 1936 Olympics was one of historical significance, not just in sports but also geo-politically. Bronze medalist Naoto Tajima, gold medalist Jesse Owens, and silver medalist, Luz Long at the 1936 Berlin Olympics, medal ceremony of the long jump competition. Tajima took a relatively unnoticed bronze to Jesse Owens‘ gold and Luz Long‘s silver in the long jump. Owens had already won gold in the 100 meters, winning the title “fastest man in the world” in front of Adolph Hitler. A day later, on a day Owens would have to run a heat in the 200-meters race, he took on a strong German team in the long jump. In this oft-told tale, the battle for gold came down to Owens and Long. While Owens led throughout the competition, Long stayed close behind, as you can see in the round-by-round details here. In the end, Owens won with a stunning 8.06 meter leap which set an Olympic record, and that Long could not match. Long put his arm around Owens after the American’s victory, creating an image worldwide that encouraged those who believed a world of peace and brotherhood was possible. But while we may forget there were other competitors, we should be reminded there was a third person on the medal stand – Naoto Tajima of Iwakuni, Yamaguchi. His medal in the triple jump and the long jump at the 1936 Berlin Games were the last for a Japanese in Athletics, until Naoko Takahashi won the women’s marathon at the 2000 Sydney Olympics. Rand thought she was done with athletics. After all, she was married with a small daughter. But the call of competition was strong, and Rand found herself preparing the Tokyo Games. When she qualified for the British Olympic Squad, and landed in Tokyo, she was four years older and wiser. And yet, the demons of past failure were still in her head. In this wonderful profile Rand in the Sunday Times as a run-up to the 2000 Sydney Games, the writer describes a joyful Rand the night before her long jump competition, singing a lullaby she would sing to the daughter she left in London, refusing to allow her roommates to sleep. “Mary, for crying out loud,” says Mary Peters from the next bed. Her roommates cannot be angry. She sings so beautifully and even now, so late at night, her effervescence bubbles. “I’ll teach you,” she says, “come on, ‘I ullowoost to halowav an alawold banjalawo’, try it.” And so in this small room at the 1964 Olympic Games, four British athletes serenade themselves to sleep. Sleep? Singing brings them to life. “Mary, I’m going to bang a nail into the wall,” says [Ann] Packer, “and from it I’ll hang the medal you’re going to win. It’ll inspire us to get the other ones.” It’s just a bit of fun but Mary Rand shivers at the mention of winning. Outside, Mary hears the rain fall, so loud it could be hailstones: “What will that do to the cinder track, Mary?” She hates not being able to control the voices. Alone in the darkness, Mary talks to God. “Please,” she pleads, “let me do well tomorrow. But as it turns out, the 24-year-old version of Rand was made of stronger stuff. 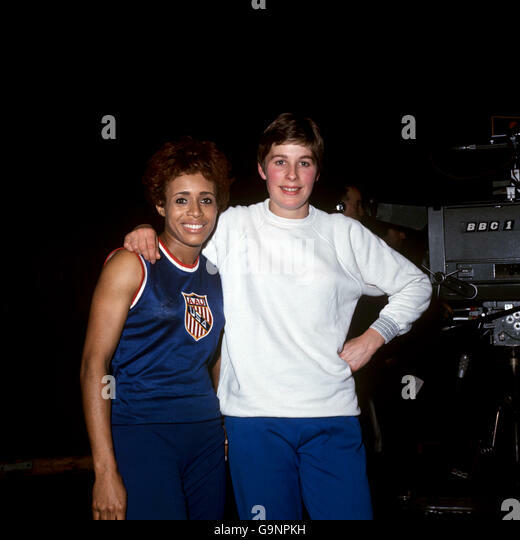 In the video interview, Rand reflected on her attitude as she readied herself for the women’s long jump competition, and her refusal to allow her competitors to psych her out during the practice period. The hardest thing in long jumping in the Olympics is everybody is trying to get their run-ups. The Russians. The Poles. They’re all pushing and shoving, you know? So you have to be pretty tough. I got a couple of jumps in. It was really cold and windy. It was a little nervewracking because in the back of your mind ‘Oh my gosh, this happened four years ago.’ And I know the press were thinking, ‘Is she going to fall apart again.’ And everything went right. Rand did not run through her mark. She did not foul. She did not crash and burn. In fact, Rand dominated from start to finish in the six rounds of the finals. In the first round, she broke the Olympic record with a leap of 6.59 meters, 35 centimeters further than Diana Yorgova of Bulgaria. In the fifth round, she broke the spirit of all competitors with a world record jump of 6.76 meters. Like many British and American athletes who were not used to the metric system, she had no idea what that meant in feet and inches. The world record at that time was 21 ft 11.75 in so she had to dig into her bag for the meter to fee conversion table to learn that she became the first woman ever to exceed 22 feet – 22 feet 2 1/4 inches to be exact. The 1960s was a period of intense competition between Puma and adidas, fueled by the sibling rivalry of the two brothers who ran the respective companies, Rudolph Dassler and Adolph (Adi) Dassler. The more images of champion athletes wearing their shoes appeared in the media, the more revenue poured in. And the easiest way to get superstar athletes to wear their shoes were cash payments of thousands of dollars. At the 1960 Rome Olympics, Armin Hary of Germany set the Olympic record in the 100 meters in Pumas, after having worn adidas in previous heats. On the podium, Hary switched back to Adidas. 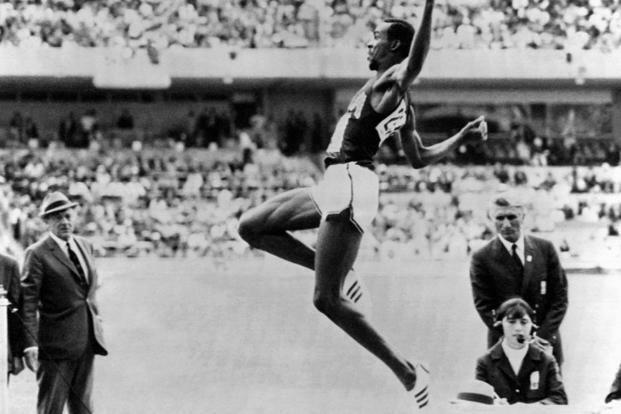 Bob Beamon shocked himself and the world when he lept 8.90 meters (29 ft 2.5 in) at the 1968 Mexico City Olympic Games. That was 55 cm (nearly 22 inches) better than the previous world record. My assumption today is that high performance athletes are particularly fussy about their foot gear. According to the book Golden Kicks: The Shoes that Changed Sport, by Jason Coles, Beamon had always trained and competed in adidas shoes. But Mexico City during the Olympics was a fierce battle ground between Puma and Adidas. Track groupie, Art Simburg, buddies to the Speed City sprinters of San Jose State College, Tommie Smith and John Carlos, was also a sweet-talking marketer for Puma. Simburg was able to “convince” many athletes to switch to Pumas in Mexico City, including Beamon. So when Beamon made the long jump finals, prior to that massive jump, he did so in Pumas. But in a switch that was becoming less and less uncommon, Beamon slipped on a pair of adidas shoes, and launched himself into the history books with a record leap that stood for 23 years. And the shoes that shine in all of those pictures of Beamon’s gigantic jump – the one with the three red stripes of adidas. It’s hard to believe, but there has never been a major film on Jesse Owens. Eighty years after Owens’ monumental achievements at the Berlin Summer Games in 1936, the film, Race, will be coming to a theater near you. During the Tokyo Summer Games fifty one years ago, Owens was asked to write a daily column for the Newark Star Ledger offering his memories from the Berlin Games, as well as his thoughts on the athletes and events of the 1964 Games. In his October 11, 1964 column, he wrote about a moment when he felt the weight of the world on his shoulders. Jesse Owens went on to write how he was feeling the pressure of representing his race, and fouled in his first two attempts at the long jump trials. Then a reporter asked Owens if he thought the German refs were purposely calling foul and how Hitler was reported to have bad mouthed Owens. That’s when the athlete from Oakville, Alabama decided to draw a line in the sand…literally. In order to ensure that he didn’t foul, Owens marked a line a foot before the launching point, and easily won the trial, which helped Owens to continue his journey to gold and Olympic glory. Below is the trailer for Race. This highly anticipated film is scheduled for release on February 19, 2016. When it does, don’t walk…race to your local theater.